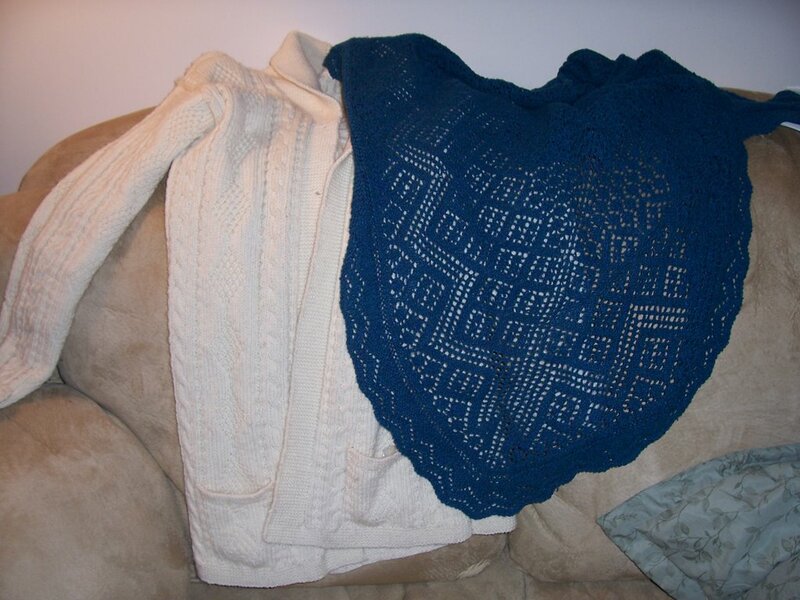 Alianne's Blog: Knitted Items Meme and Victorian Lace. I knit, sew, spin, weave and tons of other crafty endeavors! Knitted Items Meme and Victorian Lace. Chris started a meme telling knitted which items you use the most. Besides my socks which I wear every day in the winter now that I have enough, I'd have to say these two items are the most used. Lizzie and Shaped Triangle. You can see much better pictures by clicking on the names along with specs. (I know, yesterday you didn't get any pictures and today you get nothing but crappy pictures. I'll try to do better next week.) I love the Shaped Triangle because it's not delicate. It might look delicate in the pictures, but it's a thicker yarn and it is dark, so I don't have to worry about getting it dirty. Lizzie is just warm. She still doesn't have buttons or a belt, but she is warm and I just love her. And another crappy picture that just doesn't do this book justice. This is a must for any serious lace knitter's library and there are already half a dozen more projects for my ever-growing list of things to knit. My only complaint with the book is that there are a couple of shawls where there are several pictures, none of which show me the shawl like I would really like to see it. I don't know exactly how to explain it, but maybe you'll understand if you see the book. It is overall outstanding and I do adore it already. Gorgeous pictures with gorgeous scenery and lots of lovely lace. Now to decide which one to do first. I think I have my desire to make lace again. Update: I got my book from Amazon. I ordered it over the weekend. So although their page for the book is still showing "Not Yet Released", they did have them at least when they shipped mine a couple of days ago. They just haven't updated the page. Oh how funny-I was just thinking of writing about my favorite knitted things. I love that shawl and sweater!!! Whee! I still giggle a little when I see that Lizzie... It's really a lovely sweater. That is my biggest complaint about publications or books is sometimes their pictures really don't show the knitted garment. While I like artistic pictures, when it comes to something I want to make, I'd much rather see a boring picture that shows the object really well, from many angles. 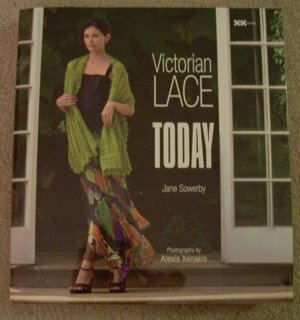 Where did you get your copy of Victorian Lace? Amazon doesn't have it yet! I must know!!! Shaped Triangle is one of my most used knits, too. Love that thing. I just check to see if that book was published and Amazon says not yet. I've been dying to see it and can't wait to get my hands on it. Too bad they didn't show the shawls well enough. So much to knit, so little time! Oh that book looks like a must have! Shame on you for making me want another lace book! Oh My! I so want that book, I must run to the bookstore tonight to see if it's available! I love your fave knitted items! I ran across your blog thru lacevember and I'd love for you to join us in the contest on my blog, it's lots of fun! Your Shaped Triangle is so lovely. I love the Lizzie too. It looks so soft and cuddly. Trying not to order just in case it comes my way through a secret pal. I am bummed. Had I know that that book was now released I could have purchased it with my latest order. I tried to add it to my shipment, but Amazon wouldn't let me. :( However, now I have an excuse to order from KnitPicks, since it is cheaper through them...and I would have to round the order out with some yarn to get the free shipping.